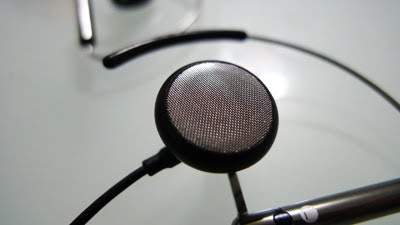 Nevermind that Creative has never been a serious contender in the audio wear arena. 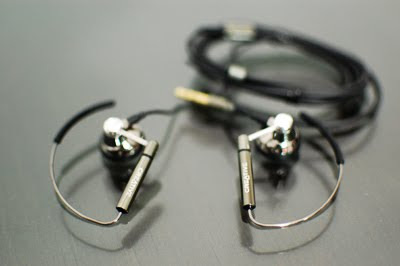 Over the years, the company has painstakingly built up its Aurvana brand series of earphones and headphones, leveraging on its past successes like the EP-630 which is a widely acclaimed and highly popular and affordable set of earphones. Needless to say, the Aurvana brand is only reserved for the best of the best in Creative and the Aurvana Air is a testament to that. 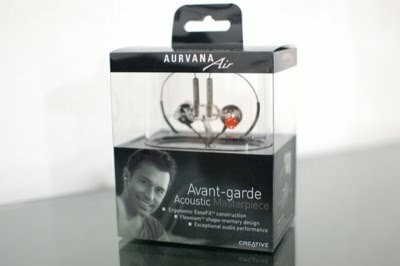 Firstly, let me start of by saying that the Aurvana Air has one of the best packaging I have seen for a pair of earphones. 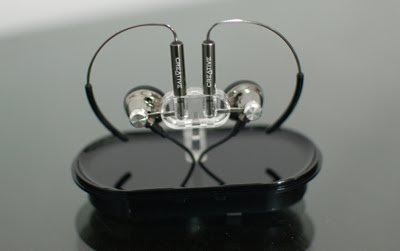 The transparent plastic box allows you to see the Aurvana Air in its full glory, encased proudly in an acrylic case. Opening up the packing reveals its full set of accessories which includes a leather travel pouch with cable management, 2 pairs of foam ear cushion and a quick start guide on how to wear your Aurvana Air and some tips and tricks to using it. 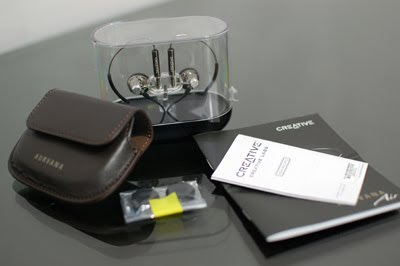 The Air is made of Nickel-Titanium alloy which according to Creative will provide you with a great deal of comfort and flexibility when using the earphones. The inert coating is catered for those who are sensitive to Nickel and is also able to withstand corrosion from perspiration and grime. The champagne-gold finishing & polished metal accent makes the whole look a little more classy. The earhook though flimsy looking is definitely not in real life. We managed to bend it till it is almost horizontal and it merely spring back into its original form. Weighting a mere 16grams, the Air is extremely light. There are many times I had the Aurvana Air on without even realizing it was there and that's really how a pair of earphones should feel like when wore. One puzzling point to me was why Creative chose to adopt the "ear bud" style concept for the Air instead of the more popular in-ear one. Although extremely comfortable, the noise leak and lack of noise isolation would be something one should consider when buying the Air. But having said that, one of the most obvious advantage of the Air is that it allows you to be semi-conscious of your surroundings and is therefore safer to use while commuting. The hinged arm and the ear hook also made it very easy to put the Air on and keep it there. I have tried jogging with the Air a couple of times and i must say that the grip is pretty secure and you could hardly hear any cable noise. The audio performance of the Aurvana Air is surprisingly good. You could hear the clarity of the acoustic tracks and it also does a great job for the bass-intensive ones. However, unlike the in-ear buds, you will find yourself turning on the volume of your player subconsciously to drown out the noise isolation.